Fried And Baked Baigan recipe by Rabaab Khan at DesiRecipes.com. 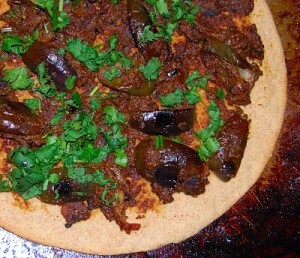 Eggplant sauted in traditional Spices; tossed in a curry and then baked. Cut baigan into thin slices. Pour oil about 2 tbsp in a pan and fry baigan slices to light brown in color. Add oil to pan as needed to fry baigan slices. Set aside fried baigan . You can skip frying baigan slices if on cholesterol free or calorie reduced diet. In another pan add oil to make masalah. when the oil is warm add onions. When the onions are light brown add salt , haldi , red chili powder (if prefer mild spicy add less red chilli then you usually do because you will be adding green chillies and crushed red peppers later on), garam masalah, daniya powder, tomato puree, ginger and garlic paste. Cook till the masalah is ready. Add water in between as needed to prepare the masalah. Warm the oven to 350 F.
Take a baking pot make a layer of baigan first. Place all baigan slices. now spread all the prepared masalah on top of the baigan slices. Add a layer of yougurt on it. and Garnish with chopped green chillies and crushed red peppers. Place the baking pot in the oven for 35-40 minutes till the yougurt is thick. Serve hot with naan/rice and raita. ony thing u forgot is salt, otherwise excellent recipe.